Home / Back-to-the-Future-II / Movies / 10 Interesting Facts About Marty McFly's Shoes From "Back to the Future 2"
10 Interesting Facts About Marty McFly's Shoes From "Back to the Future 2"
The geek community exploded last week with the announcement and release of the Nike Air Mags, exact replicas of the Nikes that Marty McFly wore in Back to the Future 2. With all the excitement, we thought we'd take a look at some interesting facts about those classic sneakers. To start with, here's the original scene from Back to the Future 2 that triggered all the excitement. According to Bob Gale, one of the creators of the original movie, the Nikes weren't supposed to be anything special. They were just part of an overall concept to tie the movies together with common elements. In the same way that the movie theater was seen in the past, present, and future, Zemeckis wanted to have the Nikes McFly wore in the original movie appear in 2015. That led them to get Nike to design a futuristic version. It was only when the movie premiered that excitement grew around the shoes. The Nikes in the movie were intended for a scene showing a game of slamball. Slamball was a game invented by the director Robert Zmeckis, played in a magnetic field that generated anti-gravity. The scene was cut, because it would be too expensive to film, so they added the scene for McFly to wear them. 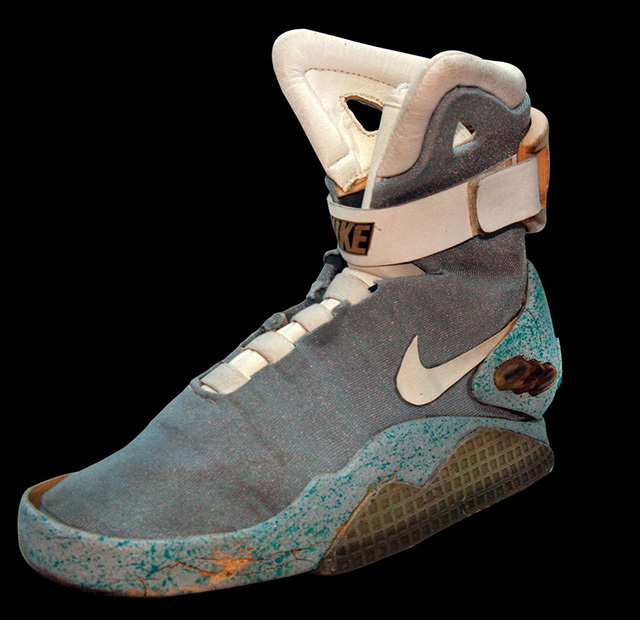 The original Marty McFly Nikes were designed by famed Nike designer Tinker Hatfield. Hatfield was originally an architect at Nike, but moved over to the shoe department. He led the teams that designed most of Nike's popular Air Jordans.He basically sat down and thought what sneakers would look like with no limits as far as technology. It goes without saying that the shoes didn't actually lace themselves or light up on their own. In 1989, lighting wasn't as miniaturized as it is today. The lights in the original shoes required a battery pack strapped to Fox's back and wiring running down his legs to power the shoes. As for the power laces, that required two different shots. In one shot, McFly put his feet into the Nikes and set them down. Then a second shot actually had the Nikes mounted onto a slab of fake cement with holes underneath to feed cables through. The cables were pulled by a guy off-screen to tighten the laces. Oddly enough, if you watch the original scene closely, you'll notice that the "laces" aren't laces at all. They're actually straps that tighten around McFly's feet. 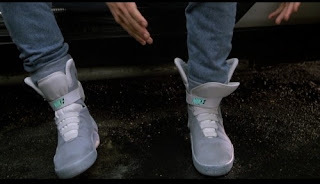 McFly never called them "self-tying laces," he just called them "power laces." The term "self-tying laces" kind of evolved on their own, but self-tying laces implies laces that actually tie themselves in knots. That technology isn't quite there yet, and really isn't necessary. I had sneakers with laces that I didn't need to tie. They had a little thing called Velcro. 6) The Original McFly Nikes Are Almost Gone. Nike built eleven pairs of the shoes for the movie, and were only intended as props. As a result, they were only designed to be worn four or five times, and were not very sturdily made. Nike kept two of the pairs, but those have almost rotted away. No one is really sure what happened to the others. When it came time to design the Nike Air Mags, they had to use sketches and the movie as a reference point. When it comes to Back to the Future 2, fans of the movie says they want three things: a hoverboard, a Delorean, and McFly's Nikes. Apparently, there was a rumor after the movie's release that McFly's Nikes would actually go into production. This turned out to be false. Over time, the Nikes came to be known as "the greatest shoes never made," but fans still wanted them. In April 2007, Mickey and Charles Maloof started a petition to get Nike to recreate the sneakers. It was called "McFly 2015: Make It Happen" (the domain has lapsed, but you can see the original site archived at the Internet Wayback Machine). The petition received thousands of signatures, and caught the attention of Wired, Yahoo, and even Kanye West, who had his iconic bear wearing McFly Nikes in his video for "Good Morning." Many credit the petition with inspiring Nike to create the McFly Nikes in real life. This isn't the first time that Nike has tried to re-create the sneakers from Back to the Future 2. In 2008, Nike released a special limited edition of its Hyperdunks, designed to look like McFly's Nikes. They came in the same color scheme as the movies, and had timestamps on the tongue with dates from the movie. They didn't cause too much of a splash outside the sneaker world, though, because they didn't light up, and had no power laces. Even then, Universal Studios apparently blocked Nike from making any more. Nike has strongly hinted that they plan to release a version of the Nike Air Mags with self-tying laces in 2015. I find this very odd, because one enterprising soul already created her own. About a year ago, designer Blake Blevin created a prototype for motorized self-lacing shoes. She quickly followed it up with a much more polished and cool version. I don't know why Nike didn't just buy the patent from her, instead of trying to make their own that's four years away. Did you ever dream of wearing Marty McFly's sneakers from the movie? Are you planning to buy the official power-laced Nikes in 2015? So none of the originals still exist? That's a bummer. I don't even remember those shoes very well so I guess I didn't dream of wearing them. But I guess it's about time Nike made some money off of them if so many people want them. Does this mean we might see another BTF film coming soon? Your shoes are extra amazing. @Alex The originals do exist, but are in bad shape. I found a picture (may add it to the post) and they're all gray and tattered. Those things should've been in the Smithsonian. unFerstanF your vision, creativity, necessity anF market very First.